with Sri Swami Jyotirmayananda (sharing his presentation via a Live Skype connection from his ashram in South Miami). Swami Jyotirmayananda is from Bihar, India, and was initiated into Sanyasa by Sri Swami Sivananda, the founder of the Divine Life Society, Rishikesh, India. Swamiji spent the next ten years teaching at the Yoga Vedanta Forest Academy, giving lectures on the Upanishads, Raja Yoga, Yoga Vasistha and other Indian scriptures. He also translated many of Swami Sivanananda’s books into Hindi and served as the Editor of the Yoga Vedanta Journal. 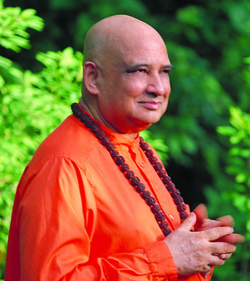 In 1962 Swamiji moved to Puerto Rico, and then in 1969 to Miami, Florida, where he founded the Yoga Research Foundation. Through insightful lectures that bring inspiration to all who attend his Retreats, ongoing daily lectures at his Miami Ashram, through the live Podcasts online, and the many books that he has published, Swamiji continues to share the range and richness of his knowledge of the great scriptures of the world. Swami Jyotirmayananda is recognized as one of the foremost proponents of Integral Yoga, a way of life and thought that synthesizes the various aspects of the ancient Yoga tradition into a comprehensive plan of personality integration. A sincere aspirant will meet for the first time, through Swamiji’s profound teachings, a challenge to the intellect to discover the secret wealth of the Self, and powerful means to attain the ultimate and true goal of life--Enlightenment.